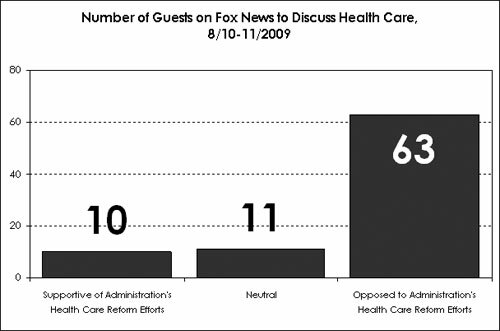 A report by Media Matters for America shows that, in segments discussing health care reform on August 10 and 11, Fox News was hardly “Fair and Balanced.” Looking at opponents of health care reform and those who support reform, Media Matters found that opponents outnumbered supporters six to one. That is 63 opponents hosted vs. only ten supporters for those two days. This unbalance is not the only problem with Fox News’ reporting. They’ve also reported several falsehoods recently about health care reform, including editing Obama’s comments. I think it is time for someone with distinction to sue Fox News for false and misleading advertising. Every time they run that “fair and balanced” crap, they are violating the law by making false and misleading statements.